If you know me, you'll know how much I love ASOS - unfortunately my purse doesn't love it so much.. One of my favourite apps is ASOS's, I can't wait to receive my monthly ASOS magazine and my 'Saved List' is always pages and 100's of pounds long. Just having so many brands all in one place is like my dream come true. Their sale is a big highlight for me, always adding to my Saved List even more. Oops. This is a little sneak peak into my current Saved List. However, as you may have noticed from the increasing number of 'Wishlist' rather than 'New In' posts, I'm trying my very best to cut back on my spending (read: I'm poor because I've spent all my money on clothes, so I need to stop so I can afford to feed myself). As you can tell, I don't really like colour. I know, I know - change your tune Ellie, you're a black/grey/white kinda gal, we know. 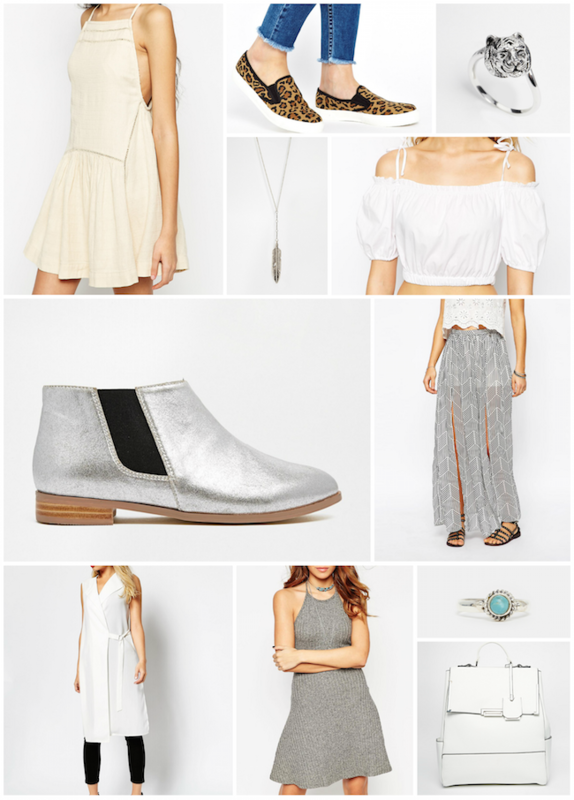 Being a tad more adventurous, I do really love the current silver footwear trend, and the boots would easily take you through summer into autumn. The ultimate favourite has to be the maxi skirt. It would be so useful and a nice way of showing a bit of skin without showing too much skin. If you get what I mean. What are your favourite ASOS sale picks?